“The Inhumans” have been a pillar of Marvel’s funny books for decades since they were conceived by Jack Kirby and Stan Lee in the pages of Fantastic Four #45 (December 1965). However, their trip to other mediums of entertainment has been fraught for some time. Many thought that with the development of Disney/Marvel’s “Marvel Cinematic Universe” seeing the relatively lesser known (yet with a strong fan base, regardless) comics IP brought to life as a movie or TV show was a big possibility. So how did Marvel and Disney adapt The Inhumans’ epic, sci-fi story into an ABC prime time series? And did they do it well? The answer to the former is quite simple: they made a soap opera. The answer to the latter is: it’s complicated. Like the sands of the hour glass, these are the days of The Inhumans. 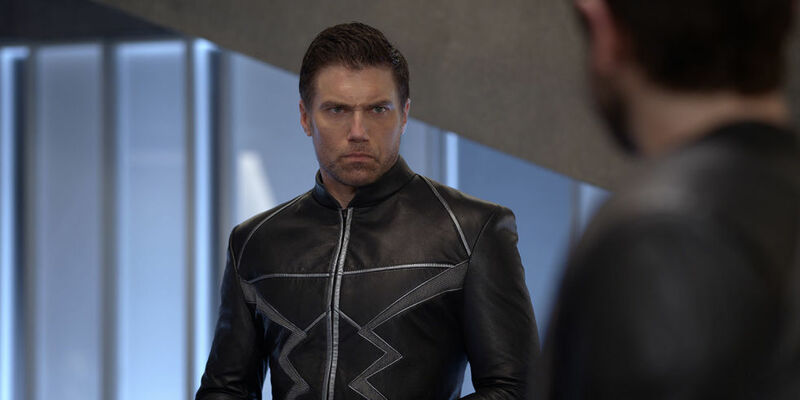 Our saga centers around Black Bolt (Anson Mount) and Medusa (Serinda Swan), the king and queen of the Inhuman kingdom Atillan. This is a hidden city on the dark side of the moon populated by the fictional race of mostly super-powered humans with alien genes (hence the title). The royal family lives almost isolated in their palace while the rest of Atillan’s populace lives as the underclass and in mines. Inhuman princess Crystal (Isabelle Cornish), Medusa’s sister, makes the most of her enchanted life alongside the family’s enormous teleporting canine Lockjaw, while Black Bolt’s brother Maximus (Iwan Rheon) agonizes living in his sibling’s shadow, left to his “thoughts…and plots” (his words). It doesn’t take long before Maximus begins his plan to usurp the throne and leave the ruling members of his family stranded in Hawaii with false promises to help the Inhuman Working Class (timely!). If this all sounds like delicious trashy soap material, it’s because…it is! Sadly, the execution of The Inhumans leaves much to be desired. The core concept has the potential for something truly fantastical and fabulous. A sci-fi tinged twist on the costumed soaps like Downton Abbey or Dark Shadows. And I kid you not, the cast tries so hard. Anson Mount has come so far from being Britney Spears’ beau in Crossroads. He’s done terrific work on the underrated AMC western series Hell On Wheels. Playing the king of the Inhumans is no easy feat. Black Bolt’s power is such that even if he were to faintly whisper, he’d unleash destructive power. As a result, Bolt never speaks. To his credit, Mount commits to the bit, having developed his own fictional sign language system while also taking a note out of Tom Hardy’s “act with only your eyes” playbook. Mount actually knows how to do a full body performance, which is important for a silent character in a medium and form where dialogue is key. Serinda Swan, no stranger to costumed comic characters, having played DC’s Zatanna on Smallville also does her damnedest to elevate a largely lifeless and turgid script. Out of all the cast members, Swan seems to be the only one who really leans into the soap of it all. Every word is uttered with the cadence as if it were designed to purposely illicit studio audience gasps. Sadly the showrunners, unsure of how to translate Medusa’s constantly animated, flowing red hair from the comics, opted for trapping Swan in one of the worst wigs this side of Party City. Medusa would be booted from the opening rounds of RuPaul’s Drag Race for that atrocious weave alone. And that speaks to the general quality of the production. Shooting in ABC Soap’s muted visual house style does no favors to the bland costumes and makeup effects lost from the set of an early Stargate SG-1 episode, nor does it help the blandest production design. There’s simply not enough panache to elevate this show beyond its network budget limitations. And that not only strands a cast doing their best to give a bland script some bite (Filipina-Hawaiian actress Sonya Balmores as co-villainess Auran brings the camp), but it also calls attention to just how cheap and small this would-be royal family drama looks and feels. Atillan is intended to be an awe-inspiring kingdom, yet every shot of the city either resembles a cutscene from an FMV-heavy computer game (the wide shots) and calls attention to the sound stage. Due credit to the IMAX-ready establishing shots of Hawaii’s beautiful landscape and the abundance of native Hawaiian and East-Asian background players. If anything The Inhumans works as a terrific ad for Hawaii as your next vacation. Shooting on location always trumps special effects magic when possible. Speaking of special effects, besides the bland aesthetic and CG-rendered backgrounds, a premise like The Inhumans demands the occasional indulgence in FX wizardry to bring the characters’ superpowers to life. While other MCU shows like the ones on Netflix or Agents of SHIELD tend to show off fantastical powers sparingly, turning each use into an Event, Inhumans tries to integrate them at any instance. That’s all fine and good considering the concept, especially in the case of the adorable CG-rendered Lockjaw. However, the vast majority of effects seem cheap at best, unfinished at worst. You’re almost thankful the show didn’t have the time to render the Inhumans’ powers longer than fleeting glimpses and teases. The action sequences also fare pretty terribly. The Netflix shows take care to have instantly memorable action (the long-take fights in Daredevil, for instance). AoS had a few years’ head start before star Chloe Bennet had such genuinely impressive action chops to the point where very little trickery was needed to make the action credible. In both cases, the superhuman abilities unique to their respective characters are often cleverly integrated into the practical stunt work. Which is what Inhumans should have done. Sadly, not only are the physical action beats so poorly done (a case of bad food and small portions), but also the use of superpowers seems really badly integrated into them. Take, for instance, when Medusa finally unleashes the ability to move her hair with her mind: the sequence, set to a slowed down cover of “Paint it Black,” basically asks Swan to stand still and glare menacingly at the foes she takes on with her lethal lacefront. The sequence lasts less than a minute (we don’t even get to the chorus of the song), and it’s so quickly cut it seems her enemies all fell down for no visible reason. The hand-to-hand combat without the use of powers also suffers from chaotic photography and editing. To be fair, action is not the show’s strongest suit. Rather, anytime the show leans into its soapy melodrama it feels right at home. Which is where this show should play. 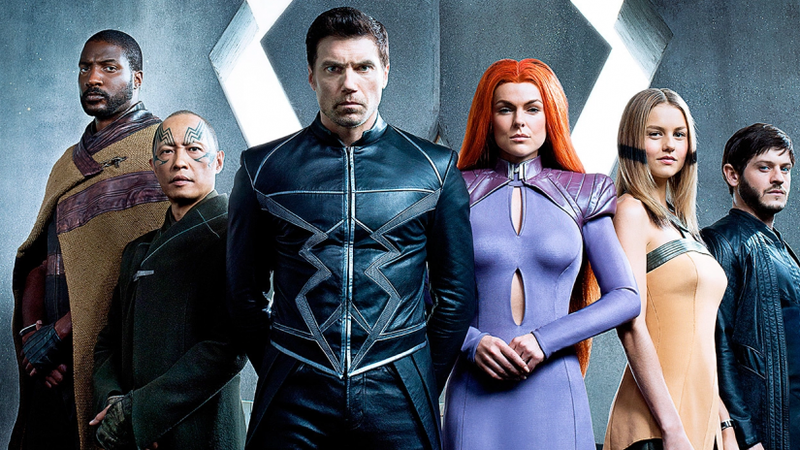 Right from the start, it’s obvious this 80-plus-minute IMAX-exclusive cut of the two-part Inhumans pilot was never meant for the big screen. In the age of “Peak TV,” where it has been argued that the lines between movies and shows is blurring, there is admittedly something comforting about seeing a show pilot that plays like a prime-time soap and knows it. The Inhumans errs more toward Agents of SHIELD‘s toying with the procedural format than Netflix Marvel’s “8-to-13-hour movies meant to be binged” approach. This pilot has more in common with Once Upon A Time than it does with Game of Thrones, and that’s neither good nor bad. The show’s drama is structured around dramatic reveals, all the while inching plot and character ever so slightly forward each episode. It’s just enough to keep viewers coming back, though the show was clearly made for the week-to-week schedule, perhaps to be enjoyed on an evening while you curl up on the sofa after work. Maybe you’d be doing other things while it plays in the background. So why was it filmed in IMAX? To be honest, beyond a business partnership and as a way to generate interest in the brand, I can’t entirely fathom this decision beyond “because they could.” That said, IMAX’s 4:3 aspect ratio felt like the correct aesthetic decision from a series that’s almost unapologetic about being TV soap. The whole thing looked less like an “epic” use of the film and camera format (see: Dunkirk and Transformers – The Last Knight) and more like a recently unearthed ’90s syndicated science fiction show someone painstakingly restored to high-definition. There was something charming about that, and I wouldn’t be opposed to the rest of the show being broadcast in 4:3. Perhaps they can add video tracking for the full effect. That Disney, Marvel and ABC ever really expected large numbers of people to feel compelled to pay top dollar to see a soap pilot in IMAX, regardless of the MCU being a largely foolproof brand, was wishful thinking at its worst. Take note that this IMAX special is not even a finished or complete version of the two-part pilot that will air on TV. And you can tell. Apparently whole subplots were omitted from the two episodes. But it’s clear the editing wasn’t done with a continuous-viewing experience in mind, with one point where a “previously on The Inhumans” is clearly supposed to play and it comes off feeling clunky. Further, it feels incompetent: there are setups with no payoffs and payoffs with no setups. And I assume points where the show was supposed to be structured around commercial breaks were faded into one another to create some sort of filmic propulsion. Instead the episodes just feel rushed and unfocused. And that’s really The Inhumans’ biggest issue. There’s definitely potential here for the show to grow into something special (Gotham and Agents of SHIELD improved tremendously in the final stretch of their respective first seasons and into their following years). However, will whatever the show becomes over time be worth the wait? Let alone worth sitting through these mediocre opening installments (in IMAX)? For now, I say no. On the off chance that you go to see Inhumans at your nearest IMAX (in case you want an IMAX theater to yourself, I suppose) you may find yourself remembering you paid to be in a motion picture theater viewing a network show that will be airing on TV in a few weeks. You’ll either laugh or cry. Personally, I found myself checking my watch often when I wasn’t squirming with embarrassment for an otherwise talented cast (and director Roel Reiné, whose 12 Rounds 2 and Hard Target 2 are among the most enjoyable DTV action gems I’ve seen) be squandered at nearly every turn. At one point in the theater a fly landed on the window in front of the projector, leaving us with a black spot crawling across the screen for most of the run time. There was something strangely cathartic about that. The Inhumans: The IMAX Experience is neither wonderful as it should have been nor as awful as it could have been. Graded on the curve of ABC high-concept soaps, such as the aforementioned Once Upon A Time, it’s just boring and frustrating with a few sparks of fun (seriously, Lockjaw is great, as is Black Bolt’s fish out of water comedy moments). Mostly, it’s just a mess from top to bottom. Sometimes it feels like incompetence; other times, budget and other limitations. The Inhumans could one day become a show where you tell someone “skip the first season; it gets good.” But it hasn’t gotten good yet, and this opening salvo is just plain inhumane. Next → Next post: Deadshirt is Reading: Kingsman, Royals, and Star Wars Adventures!